← Trade for Aid for Nepal – Help Make it Happen Today! If U.S. importers and emerging-market exporters of certain GSP-eligible items do not act by Monday, November 23, nine products from six countries would likely lose duty-free entry into the U.S. market under the Generalized System of Preferences starting on July 1, 2016. Sandler Trade LLC has identified nine tariff lines that currently exceed or could exceed the Competitive Need Limitation (CNL) thresholds. By statute, if a country demonstrates “competitiveness”, as defined by obtaining 50% of total U.S. imports in a tariff line or if a tariff line has total U.S. imports of $170 million from a country in 2015, then the GSP-eligible country will lose duty-free treatment for the specific tariff line. 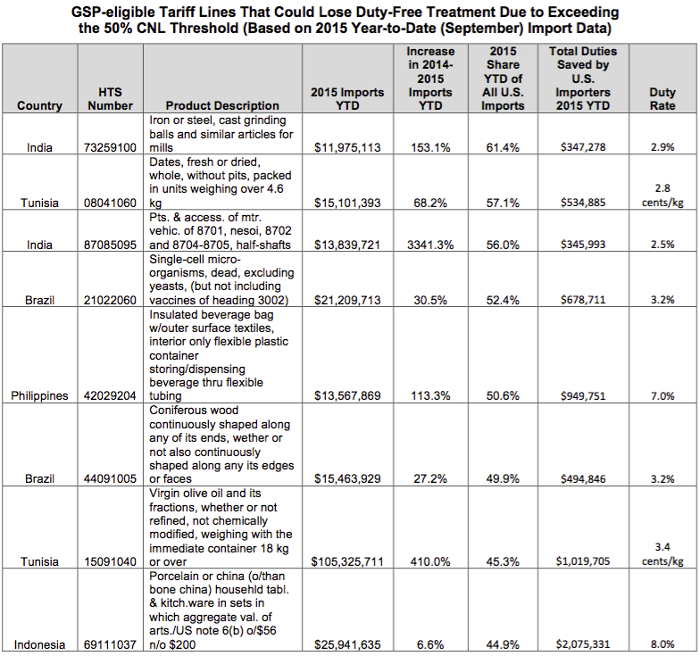 The two tables below list the tariff lines and the corresponding countries that are in danger of losing duty-free entry into the U.S. market under GSP next July 1. The GSP statute allows for “interested parties” (U.S. importers, exporters, or trade associations) to petition to retain duty-free treatment for a tariff line that exceeds the CNL thresholds. If successful, the petition can result in a Competitive Need Limitation (CNL) Waiver, which retains duty-free treatment for a product for at least five years. Petitions for CNL Waivers are due on Monday, November 23, which is only two weeks away. As the “Duties Savings” column from the tables below demonstrate, U.S. importers have significant money at stake, with duty savings ranging from several hundred thousand to millions of U.S. dollars. We urge U.S. importers and their foreign suppliers to consider submitting a CNL waiver threshold by the November 23 deadline. To learn more about our track record and how we may assist an interested party to file a petition and gain its approval, please contact Mr. Romulo Cabeza or Ms. Marideth Sandler at 202.350.4303 or by email at rcabeza@sandlertrade.com or sandler@sandlertrade.com. There are two Competitive Need Limitation (CNL) Thresholds: 50% of total U.S. imports, and $170 million total U.S. imports.